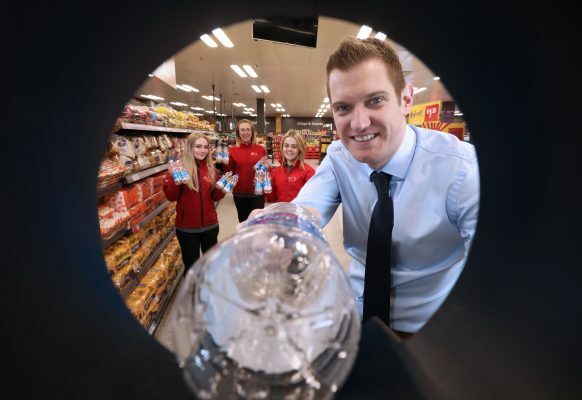 Today, Iceland launches the first in-store reverse vending machine in Northern Ireland, as it looks to continue its efforts to reduce the impact of single use plastics on the environment. The UK’s leading frozen food specialist will be trialling the machine for six months at its Belfast Park Centre store, to further understand consumer appetite for the scheme. The installation follows the supermarket’s results announcement of its UK-first trial of in-store reverse vending machines, which saw more than 310,000 plastic bottles recycled over a six-month period. In November alone, a daily average of 2,583 bottles were recycled across four sites, with an average of £250 in coupons refunded per day. Reverse vending machines reward individuals for recycling, by providing money or vouchers in return for empty containers. Iceland’s reverse vending machine accepts any plastic beverage bottle purchased in Iceland and repays customers with a 10p voucher to be used in store for each bottle recycled. The installations came in support of the UK Government’s proposed Deposit Return Scheme in England, and were launched after Iceland became the first retailer to commit to removing plastic packaging from all own label products by 2023. With the objective of understanding consumer perceptions and potential engagement levels, as well as industry and operational insights, the results of the trial have been shared with UK’s Department for Environment, Food and Rural Affairs (DEFRA) to further support the consultation. The initial trial incorporated England, Scotland and Wales with machines installed in Wolverhampton, Mold, Fulham and Musselburgh as well as a machine for staff use at the retailer’s head office in Deeside. Following its success, Iceland is extending the trial for a further six months to collect additional data on the positive environmental impact of a potential national roll-out. Richard Walker, managing director at Iceland, commented: “The overwhelming consumer support we have received in response to our reverse vending machine trial clearly demonstrates consumer appetite for improved in-store recycling, and deposit return schemes. “We have expanded our trial to Northern Ireland to ensure our trial is as robust as possible and is representative of customers from across all of the UK. The trials across England, Scotland and Wales have now been extended for a further six months which will enable further data to be collected and analysed, reflecting a twelve month period. The results of this latest trial in Northern Ireland will be shared with local councils and the Department of Agriculture, Environment and Rural Affairs (DAERA).